Home Paint, Inks, Mediums,... Acrylic Paint Golden Acrylic Golden High Flow Acrylic Golden High Flow Acrylic 1 oz. Pigment Classification : Mixture Chemical Description : NA Opacity/Transparency : N/A Lightfastness Rating : I Permanency : Excellent Color Index Name : NA Color Index Number : NA Munsell Notation Listing : NA Viscosity Range : NA Gloss Average : N/A CIE L*a*b* Values : NA Tint Strength : NA A modern version of historical Alizarin Crimson, which was a substitute for Rose Madder, a dye use for the British Red Coats. 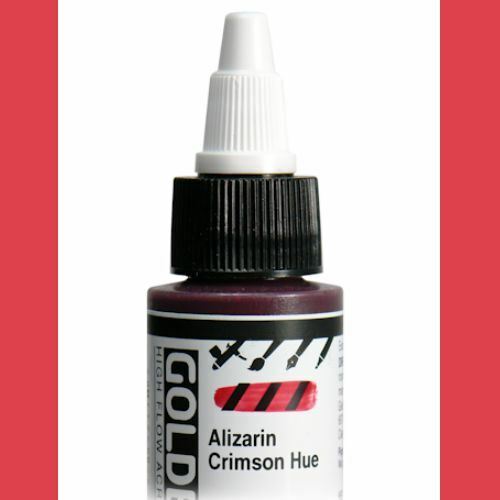 Our mix of quinacridone and phthalo make this exceptionally lightfast and strong tinting, with a deep reddish brown undertone like the historical color.